Happy New Year! I hope everyone had a lovely holiday season. And with the New Year, I’m finally giving you something a bit healthier! Although it IS still bread, but it’s whole wheat so it’s a whole lot better then the sugar fest that’s been happening here for the last month! I had never had Parker House rolls before making these. Had no idea what they even were. I had to google it. Evidently it’s a dinner roll that was developed at a hotel in Boston, with a distinctive folded shape, a crisp buttery outside, and a fluffy tender inside. And they’re amazing. Google never told me that though. These rolls did. And I can’t wait to make them again. I’ve mentionned before that I absolutely love to make bread. There’s something very satisfying about making your own bread. Kneading, shaping, watching it rise. And then devouring it straight out of the oven slathered in butter. All good. If you’ve never made your own bread, I most definitely recommend it. The stuff from the store doesn’t hold a candle to homemade. It is so incredibly good, that I’m willing to bet that if you try making it, you won’t want to go back to store-bought bread. And it’s really not that hard. It does take some time, but a lot of that time isn’t actively doing anything, it’s just waiting for the yeast to work it’s magic. I know that a lot of people are a bit intimidated by working with yeast, but seriously, don’t be. It’s really not difficult. Although if you’re nervous about it, I definitely recommend starting with instant yeast, and not active dry yeast. With instant yeast you mix it right into the flour, there’s no messing around with activating it in warm water before you begin. The only thing you need to be a bit careful of when working with yeast is the temperature of your water. The ideal temperature is 100 degrees F – this feels very warm to the touch, but it won’t hurt at all when you test it with your hand. Although I would recommend using a thermometer to check the temperature until you have a very good idea of what 100 degrees feels like. If your water is too hot, it will kill your yeast, so err on the side of warm, not hot if you don’t have a thermometer to check. If the water is not quite 100 degrees, it won’t effect whether or not your bread rises, it will just effect the speed at which it does. 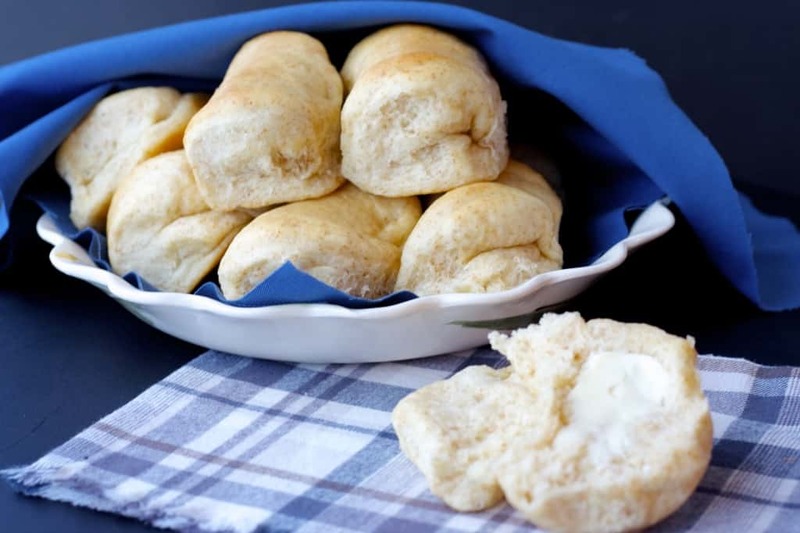 If you’ve never made your own bread, this recipe is a great one to try out! It’s quick (only about 2 1/2 hours from start to finish) and easy, and you don’t even have to knead this dough. Just mix it together and put it in an oiled bowl to rise. Then shape the rolls, rise again, and bake. Quick, easy, and so amazing. Try it, you won’t regret it. These rolls are fantastic! Combine the honey, hot water and canola oil and beat with an electric mixer. Add the salt and eggs and beat well. Once the mixture has cooled to just lukewarm (about 100 degrees F), add the instant yeast and keep beating. Add the flour, starting with just 3 cups of whole wheat flour, and continue mixing (with the dough hook if using a machine) until a soft dough forms. If the dough is really sticky and not coming together continue to add the last cup of whole wheat flour, 1/4 cup at a time until the dough comes together. It should be a very soft dough, so don’t overflour or you’ll have tough rolls. Don’t knead the dough, once it is finished mixing together, just transfer to an oiled bowl and let rise, covered, for 60-90 minutes. Once the dough has doubled in size you’re ready to shape the rolls. Roll the dough out on a lightly oiled countertop to 1/2 inch (1.5cm) thickness. Cut out 3 inch (7.5cm) circles. Holding the dough circle by the edges, dip both sides in the melted butter. Then fold the circle in half on the baking sheet and pinch the edges together to seal. You need to press down hard on the seam, pressing the dough down until you can feel the baking sheet, or it won’t stay closed. Continue this process with the rest of the dough, arranging the rolls on the pan so that they are nearly touching. Cover with a clean tea towel and let rise for 30-45 minutes. Preheat the oven to 350 degrees F. Once the rolls have risen, bake for 18-20 minutes. When they come out of the oven you can brush the tops with the leftover melted butter if you like. Remove them from the baking sheet to a wire rack to cool completely before storing in a sealed plastic bag for up to 5 days. They also freeze well. Love that these are made with whole wheat flour! You're not the only one who never had a Parker House roll, only difference is that I live in RI which is pretty close to Boston, MA! Now that has me thinking of planning a date night in Boston with my hubby!! Quick question, if I used bread flour instead of the all purpose would it be the same outcome? I've just recently started making breads with wheat flour so I'm still learning on how it works and such! P.S. LOVE your blog and super yummy easy recipes! Thank you so much for your kind words Sarah! Made my day! :) Yes, bread flour would be fine - most likely better then all purpose, I just never have it on hand so I almost always substitute all purpose flour for bread flour. Substituting the other way shouldn't be a problem! Enjoy! I love homemade rolls. Never made whole wheat will have to try. Love the addition of honey! 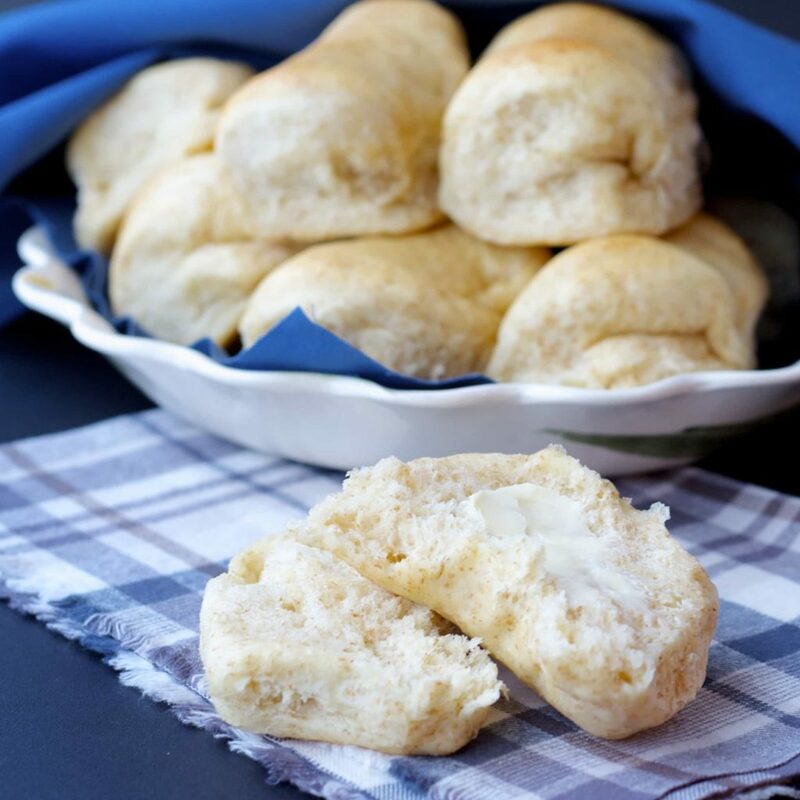 Soft honey wheat rolls are my weakness and yours are totally calling my name! They look amazing!! Completely a weakness for me too, they are just so good! Especially warm from the oven! Thanks Kelly! 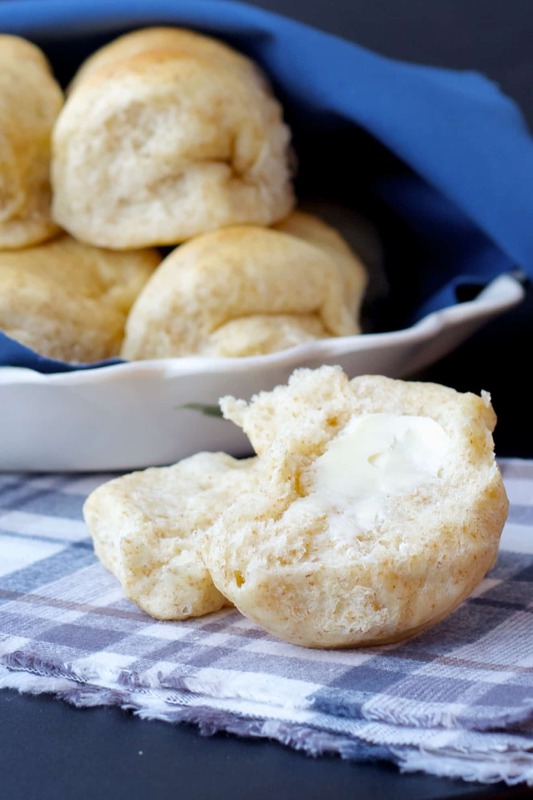 I only ever make my own bread and rolls from scratch so this is a perfect recipe for me. I definitely will be making these soft and fluffy rolls! Thanks Thalia, hope you enjoy them! Love how soft and fluffy these look Stacey! I love making my own bread, it's one of my favorite things to bake! Pinning this! I love making bread, too! I don't do it as often as I would like, but it's almost therapeutic for me! These whole wheat rolls sound like the perfect bread to ring in the new year with, Stacey! I love that they're on the healthy side and filled with a honey flavor. Sounds like the perfect side for a dinner or even for breakfast! Pinned! Thanks Gayle! I agree, it's completely therapeutic, I love it! Thanks for pinning! I so agree - I absolutely love the process of making bread. At it definitely blows anything you can buy right out of the water!! I loveee me some fresh rolls - these look so good! I am obsessed with rolls, so I can't wait to try yours! Honey wheat are my favorite. Thanks Pamela! Honey wheat is one of my favourites too! Thanks Alessandra! Happy new year!